I’ve been a Birchbox subscriber basically since it started, and now I’m happy to say I’m a Birchblogger, which gives me access to even more Birchbox-greatness & opportunities to share my beauty knowledge! This weekend Birchbloggers got a sneak peak video of the August box, with the theme of Finishing School, which means this box is packed with everything you need to put the finishing touches on your Back-to-School/ end of summerroutine & look. Check out Hayley & Katia showing off the August Birchbox above! I love Juice Beauty, so I’m thrilled I may be getting the Juice Beauty Oil-Free Moisturizer in this month’s box. I’m also loving the Whish Coconut Milk Correcting Gel, I’m not familiar with this brand at all, so it’d be fun to try something so new! I guess I’ll just have to patiently wait & see what’s in my box! This month Birchbox has also added some new products to their Birchbox Shop! I’m loving this SuperGoop! Antioxidant Infused Sunscreen with Vitamin C! If you aren’t a member of Birchbox yet, you should def subscribe, it’s the best $10 a month you’ll spend, I promise!! Sign up, here! I was SO excited when Birchbox announced they were teaming up with Gwenth Paltrow’s goop for the October Birchbox. I subscribe to goop so I couldn’t wait to see what they would curate for us!! I don’t understand what happened…it was supposed to be great. I’m not saying the products are bad, they’re high quality, and I’m sure they deliver results. I think I just expected a bit more pizazz, I felt it was a little dry. First, a Luna bar. I can get a Luna bar anywhere, right?? And, I’ve had the lemon zest bar before, so nothing new here. I am really excited to try the Karuna Hydrating Treatment Mask, they suggest you use it on a long flight. I don’t know where I’m going anytime soon, but whatever, I may just save it for my next journey. Next is Embryolisse Lait-Crème Concentrè, or 24-hr miracle cream. I like miracles and I like creams, so I’m thinking I’ll like this product. Nowwww, while it’s a great hydrator, it can also double as a makeup remover, so that’s pretty great. The last two products are Lulu Organics Lavender + Clary Sage Hair Powder. I’m all about dry shampoo because I try to preserve my color the best I can, which for me is not getting my hair wet. I’m loving the fact that this dry shampoo has lavender and sage– a little added bonus compared to my normal dry shampoo I use. Last, is Naked Princess Naked Shine Luscious Lip Gloss. 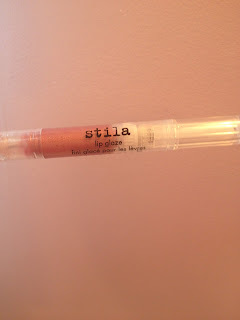 Since I only wear pinks and neutrals on my lips, I know I’ll get good use out of this sample…or should I say one use, since it’s ridiculously small. Sooo, as I was saying about my disappointment in the goop Birchbox. The products are decent, and I know I’ll enjoy them. I just thought overall it was a little lackluster, and seeing that I love Birchbox SO much, and have been a member basically since the day it started, I was just slightly disappointed. BUT, also, I realize Birchbox isn’t 100% to blame as goop really should’ve tried to WOW us like never before! Such is life, I’m just looking forward to my good old regular Birchbox in November!! PS: I’ve been reading a lot of other people’s review on the goop + Birchbox collab (most, if not all, of them as disappointed as me) –but actually some other goop boxes got more interesting products like a full size essie polish and Kiehl’s Body Cleanser. If I had gotten either one of these, or both like some people, I think I would’ve been way happier- especially since I’m an original Birchbox-er!! 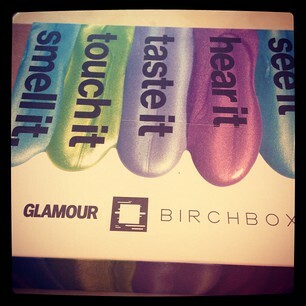 This month’s Birchbox was curated by one of my favorites, Glamour magazine with the theme “the senses”, as you can see by the box. Everything in this month’s box definitely covers those categories, I’m loving it all! All of the products are perfect for the middle of summer, and they can all come with me in my beach bag if need be! B.B. Cream is the new ‘it’ product of the year. Every single company is coming out with this serious miracle product. Boscia is a fabulous brand so I’m very happy I get to try out their version of the perfect B.B. Cream. In case you’re unfamiliar with the B.B. trend, this product works as a one step primer, SPF, serum, and foundation. Some B.B. Creams come in different shades to match various skin tones, but Boscia’s claims the product adjusts itself to match many different skin tones. I’m loving this ‘Blue-Ming‘ polish from Color Club. Turquoise had been seen in every brand’s lacquer collection this spring/ summer, this is just another shade I’ll have to try! 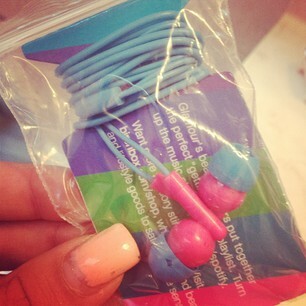 I recently lost my headphones, so I was pleasantly surprised when I saw these in my Birchbox! I love the unique coloring, and featured as a ‘lifestyle extra’ they’re perfect for summer, and more importantly, perfect for a beach day. Birchbox is always including some sort of perfume, which is cool because I can just throw it in my purse for whenever I need a quick spritz, and it allows me to sample the TONS of fragrances we have in the beauty world! 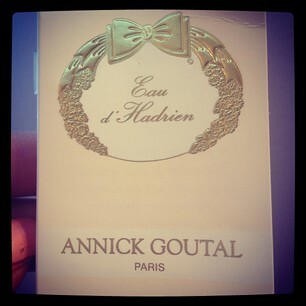 This fragrance is by Annick Goutal, and it’s called Annick Goutal Eau d’Hadrien. The scent is very citrusy, so you don’t need a lot to have a good scent. This is definitely my favorite product featured in this month’s box. 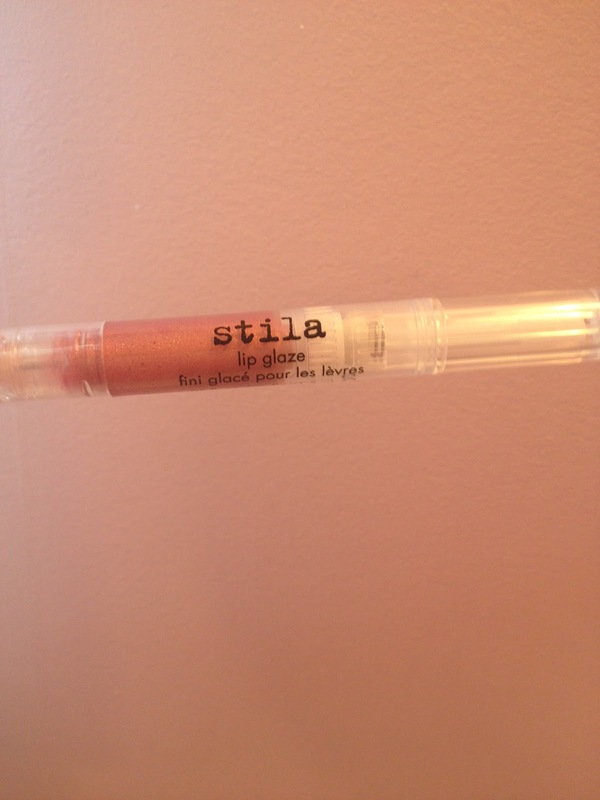 Stila’s Lip Glaze have always been on my favorites list, and this color is right up my ally. The name of this Lip Glaze is ‘Action’ and it is from the ‘It’s Go TimeLip Glaze Trio’ limited edition set. It’s super shimmery and shiny looking, which is the best part, duh. 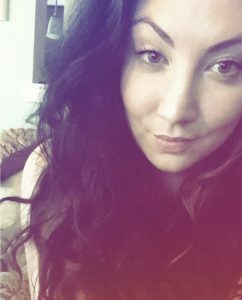 Seeign that I had a gross stomach bug the other day, I was super excited to open up my Birchbox and get a little glam into my day. Here’s this month’s goodies!! I think this nail file is absolutely ADORBZ. I don’t even want to use it because it’s too cute. 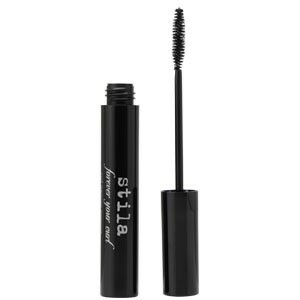 This product an Allure Best of Beauty Award, so I’m excited to try it. We’ll see how I like it compared to my absolute favorite Laura Mercier tinted moisturizer. I’m not sure how I feel about press on liner, but I guess that’s the point of this — to try new products! I’m glad the Birchbox website gives instructions on how to apply them properly, and some additional tips for making them last long. Dermalogica is a great and somewhat expensive brand, I def wouldn’t just go out a purchase this, especially since I have a favorite exfoliant. But, I’m really happy I get to try this out, and who knows, if I love it, I may end up purchasing it! 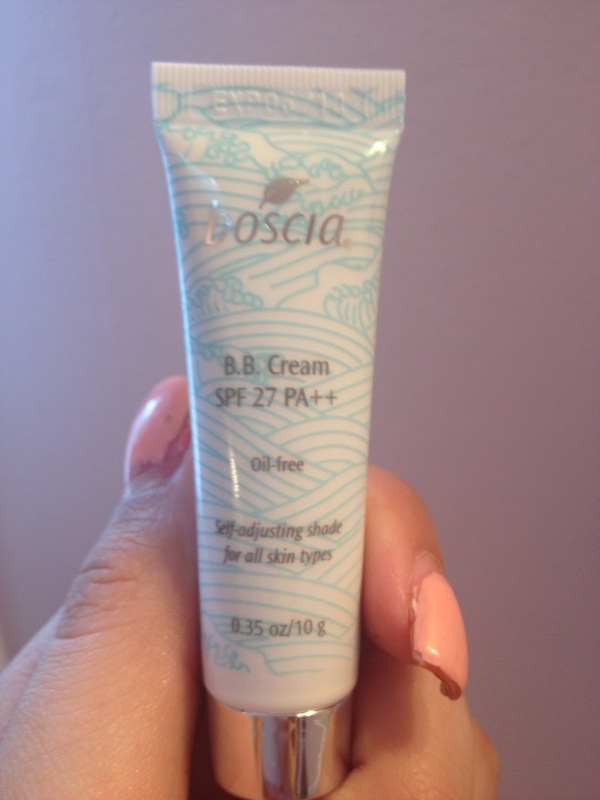 I know I’ll love this considering it’s my favorite serum — so Birchbox knows me well!! And, if you’re interested in signing up for Birchbox click here! It’s $10 a month for amazing samples, you also earn points with each box that can be put towards money off of a full sized product. I love the Birchbox blog, and they also have great tips and videos on their website. Yay, I got my September Birchbox last week! I know you probably can’t read the little note above, but it basically says that Birchbox is celebrating it’s first birthday! This month’s box is filled with products that “represent every aspect of the Birchbox personality”. I’m loving the Birchbox friendship bracelet, it’s super cute and simple and it’s a nice addition to the box that every Birchbox girl will have. I think the Birchbox team have done a great job marketing their brand, and the products I’ve gotten each month really fit what I like, they actually use that quiz you first take when you sign-up! The first product is Jurlique Purely Age-Defying Firm and Life Cream. The full size retails for $70, so I’m really happy I get to try this product out in a sample size. The botanical ingredients target dullness, which I think will be great when the weather starts to get cold and dry…which tends to dull skin quickly. I’m also loving these Incoco Nail Polish Applique in cheetah print. The picture below is a close up, I LOVE this print and it has glitter in it, which is obvz a huge plus for me as well. The Sally Hansen nail polish strips work great, so I’m excited to try a different brand to see if they work just as well! The next product is a mineral foundation with SPF 30, by ColorScience. I’m gonna try to use this sample ASAP because I typically only use liquid foundations in the cooler months to keep my skin hydrated. The last product is Salvatore Ferragamo’s Attimo L’Eau Florale. This is a very floral scent, which automatically makes me love it. I think I may end up buying this in full size, it’s light and classic. You can tell there’s a lot of different notes of florals, but they blend together perfectly. It’s super feminine and I think would work best for going out at night. 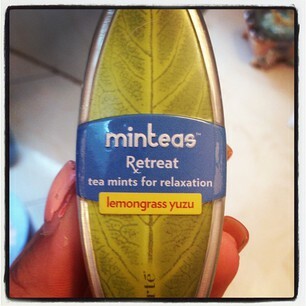 When I tried it for the first time I literally kept sniffing my hand, I just loved it so much. And, major plus, I put it on before I started my day of classes, and it lasted for such a long time, I was really impressed. If you haven’t signed up for Birchbox and are interested, click here! Even if you want to try it for just 1 month, I highly suggest it! Author ElizabethPosted on September 20, 2011 January 15, 2018 Categories SkincareTags BirchboxLeave a comment on September Birchbox!